CAME Frog (Electro-Mechanical) Underground Kit. 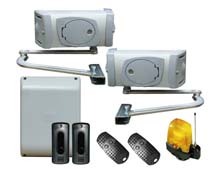 Heavy duty Electro-mechanical underground kit suitable for domestic & small commercial applications. From 1.8m to 3.5m each leaf. 240 & 24v 400 to 800kgs per leaf. CAME Ferni (Electro-Mechanical) Articulated Arm Kit. Mechanical motors suitable for domestic and light commercial applications upto 4m each leaf. CAME Fast (electromechanical) Articulated Arm Kit. Mechanical motors suitable for domestic applications upto 2.3m each leaf. 240 & 24v 200 to 300kgs per leaf. 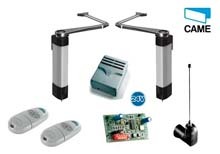 24v kit for swing gates upto 1.8m each leaf. 100 - 150 kgs per leaf. 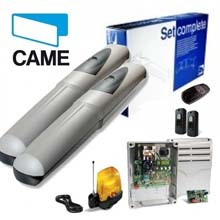 CAME Ver Garage Door Kits. 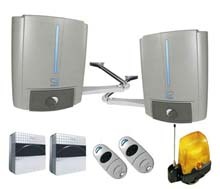 Mechanical garage door automation kits.